700 hits and 32 downloads in broadcast format reaching a high value, niche audience over three days of Clearing for a short burst, high impact campaign. Clearing is crunch time for many universities. 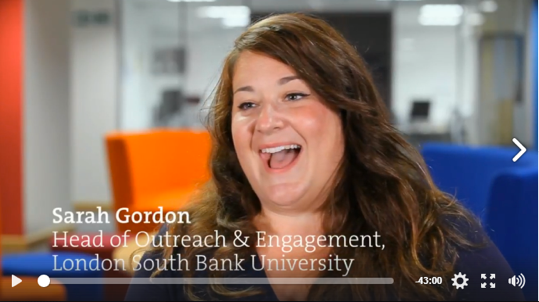 London South Bank wanted targeted support at this crucial time of year to ensure stand-out social and broadcast presence to support student recruitment. Twelve directed lming and editing in the Clearing Centre at LSBU and created a bespoke ‘media hub’ where footage could be downloaded in a range of formats, giving journalists the freedom and information they wanted at this hectic time. The video of Sarah Gordon, Head of Recruitment and Admissions, got the most traction and she proved our ‘star performer’ on the day. We received over 700 hits and had 32 downloads in broadcast format. Quotes from the videos were lifted and used in print media as well as broadcast format.